I was speaking with a prominent writer fairly recently, about a couple different things, and we paused for a few minutes when the discussion turned to scenes and the skill and art and necessity of capturing scene. We talked about the fundamentals of scenes and looking for not just any detail, but important details, and how you know when you lock eyes with an important one. 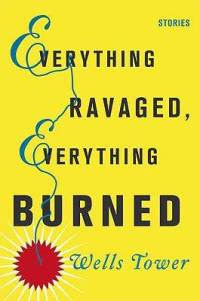 There’s no better display of scene – and the mastery of bringing them to life through the dry ink on pages – than Wells Tower’s book of short stories Everything Ravaged, Everything Burned. Everything Ravaged is a nine-stop ride on a dark commuter line with Tower’s characters, who take on different names in these first-person narratives. The chapters are saturated with despair and disappointment and failure and the shards of splintered childhoods and broken families and, well, yeah it’s not the most pleasant of reads. It’s a book about downtrodden, middle-aged lives. Tower portrays a full range of emotions through narrowly focused portraits into the rawest and darkest nooks of his characters’ souls. Reading feels like an unimpeded act of invasion. It’s uncomfortable. I was often left to lay the book on my lap at the conclusion of a scene and decipher what Tower wouldn’t tell me. A number of scenes lead you to a well only to find it dry. Why did Matthew go off down the road? Why did the scene end that way? What happens when he disappears into the white fog? Why does the story end with him quietly shoving a forkful of food in his mouth? WHAT THE HELL DOES THIS MEAN!!!??? Tower’s scenes are so brilliant because they bring you to the precipice of a story, of an encounter, of an ending, and then vanish, forcing you to deal with the pieces. They show you so much, tell you so much, and leave you uncertain of even more. But not all scenes. Some of them just nail it and are fulfilling in odd ways. For the full effect, you must pick up the book. But here are two of my favorite scenes from Everything Ravaged. Burt gets a message from Lucy to meet her and his father, Roger, in New York’s Washington Square Park. Roger married Lucy when Burt was 10. His father was 46, Lucy was 21. We are told that through the last decade, Roger’s mind has gone from present to occasionally present to all but gone. Burt’s father appears to be a shell of himself, the victim of a mind-eating disease, but in a way it’s not much different for Burt. Burt begrudgingly hops on the subway and heads for the park, where his father is engaged in consecutive games of chess with a man named Dwayne. Burt hasn’t seen his father in 15 months, and you get the feeling that he hasn’t actually “seen” his father in a lot longer than that. When was the last time Burt held a conversation of any substantial meaning with his father? When was the last time he had felt like the son of this absent man? He spots his father and approaches him. Overhead, a large blue violence of storm clouds had begun to swell, but my father took no notice. He hunched to the game, giving me his broad sueded back. In this scene, Ed is called by his ex, Jane, to come help with an accident. Jane had previously left Ed for her “meditation instructor,” a bearded man who took care of his physical self and believed, perhaps to the point of delusion, in these quiet methods of nurturing used on the mental and spiritual self. Ed freely admitted that Barry was a better looking man. When Ed saw Jane once a month – on the day he went to pick up their daughter, Marie – it didn’t escape him that Jane began to look better, too. She had given up alcohol and closely followed Barry’s routine of yoga and meditation and whatever else. Barry had an accident and hurt his ankle pretty bad, and Jane was in the midst of something called an “isolation” where she was supposed to spend 36 hours alone. She needed Ed to come pick up the injured Barry and Marie. So Ed does, and he gets there and cracks a couple wise jokes about Barry’s injured hoof, and then he helps Barry to the car with Marie. But before Barry gets to the car, he stops to pause at the mountain scenery, sniff the fresh air, listen to the quite. A flock of geese fly overhead, and it is here that Tower delivers another of his poignant images. Barry hoisted Marie up so she could see over the car. One arm slid across her shoulders, the other caught her in the crook of her knees, and he propped my daughter on his stomach in a way that showed he’d held her like this many times before. The scene carries on a little more, but after those lines, I’m afraid there’s nothing more to say. This entry was posted in Uncategorized and tagged Authors, Books, Fiction, writing. Bookmark the permalink. I bought that book for my Kindle a bit back and haven’t read it yet. I think I’ll move it up to the front of the queue. I agree about scenes – it’s like a foreign language – you have to keep working at it until you find yourself thinking in scenes. Only then can you write them effectively. Thanks for reading and the thoughts. I’d bump it up in your queue. You’d probably rip through it pretty fast, as it’s just nine stories and Wells’ writing is so vivid that it can be captivating. Let me know what you think of the book.